Previous discussions have been moved to Wikitravel_talk:Article naming conventions/Archive. 13 Mount X or Mount X National Park? 24 Naming too many articles "YY National Park"
27 "Next place up in the hierarchy"
31 Translating place names into English? 32 Do &s in titles break pages? Restaurant naming discussion moved to Wikitravel talk:Foreign-language_names#Establishment names. We haven't really had a big problem with this so far. Kansas, Northumbria, Bavaria, etc. all work out pretty well without an extra name at the end. So, I don't think we need a special rule for it. If the province or prefecture is more often called "X province" than "X", then just use "X province" as the name. Some examples: County Donegal, Orange Free State. If not, then use "X (city)" and "X (province)" (this is the first rule for disambiguation). If one or the other is sufficiently better known that the disambiguators are strange, use "X" for that one, and "X (disambiguator)" for the other. I find that rule 1 is more usefull as it shows the context, eg Georgia (USA) is more usefull than Georgia (state). My opinion is that the (<level>) notation should be used only when the lower level name refers to a location in the higher level, eg. New York (city). Just my two cents. So, I've severely abbreviated the section of foreign-language characters. It was contradicting, in part, the first section, which I think is the paramount rule (most common English name for a place). If the most common English name for a place has a non-ASCII accented character, we should of course use that name; it's not our job to make up names for places, just to fit in URLs. If there is no English name for a place (a very rare thing), we should use a romanized version of the local name. Use only Latin characters for all article names (not just place names). Latin characters are the letters A through Z, capitalized or not, with or without accents or diacritics. I believe they should be move to the best anglicied version of the word for the page title. By all means show the unicode or whatever makes the characters look right in the text of the link but I think we should only use the characters A-Z for English articles. My logic is primarily that the sort order is disturbed as Å follows Z rather than A in unicode and hence English searches. If you provide both alternative spellings in the text then the name will turn up on a search even if the wrong character was used. Interesting strawman you've constructed there, but I'm talking about shortest common forms, the assumption being that there are several common forms to choose from. Catalina is weird. In California, we usually use the San/Santa prefixes for Spanish-named places. Catalina is the only one I can think of where the Santa is routinely dropped. I'm unsure which form is the most common. I suspect without any actually facts to back me up that Santa Catalina is used more in print, and Catalina is used more verbally. Hypothetically, however.... this brings up a number of interesting questions. If form1 of a name is used more often than form2 verbally but less often in print, what then? If form1 and form2 are pretty much equally used, what then? so you're reverting to an unused name again? Taking a look at wikipedia  I confirmed what I stated in my explanation: The Ukraine is a deprecated nomination, using it would be like using Lutea instead of Paris. I agree both are similar enough to recognize it, but I see this as an update of the current situation. While I would not use Wikipedia as a primary source for confirming English usage, what that article does say is: "The country is often referred to in English with the definite article, as the Ukraine." And the reason for this usage stems from the country previously being formally called The Ukrainian Soviet Socialist Republic in bygone times; with prefixing the definite article being necessary usage in English. This English article usage carried over into the abbreviated form of the Republic's name, which is now the country's name. This usage is still acceptable English - even according to the Wikipedia article - though many media organisations are now avoiding it for the sake of political correctness. What Wikitravel's article naming conventions are saying about using the definite article is do not use The as a prefix to the article name about the country of Ukraine, because the place name is not always used with a the in front of it. I think it is already saying what you are trying to say, but for entirely different reasons. I would prefer to keep this example of the avoidance of including The in an article name for pragmatic reasons - because it is a common English construct for many place names - and in Ukraine's case also apparently Politically Incorrect and possibly inappropriate usage. I disagree. People will typically type Huntsville. The Wikitravel:Article naming conventions say we use the simplest English names. If two names are the same ONLY then do we disambiguate, so we then use Huntsville (Alabama) and Huntsville (Ontario), together with a Huntsville disambiguation page. Remember, this is NOT Wikipedia. (And I also think the people at Wikipedia got it wrong. But it was too hard for them to explain how it should have been done.) We have different rules. The current instructions even explain why. I also think it makes less sense to call an article about a place Huntsville, Alabama than Huntsville (Alabama) because if I want to call it Huntsville all I write is [[Huntsville (Alabama)|]] not [[Huntsville, Alabama|Huntsville]]. It is less work, surprisingly! Besides we only need the (Alabama), or whatever, if there are two or more Huntsvilles. In probably 90% - 99% of cases there is only one place with the name that we want to write about and have a page for. That means most of the time if we enforced a name, state format we would do too much typing and we would have a lot of redirects from places called name to name, state when there was no need. We might even end up with two articles, one called name and one called name, state. Besides this is also too UnitedStatesOfAmericaO'Centrick, nobody else in the world wants to put their state name after their place name, just to get a unique name. Other countries just call it by the place name and make sure that there is a good national place name approval process so that not too many important places get a duplicate name. And if they are duplicates then they are on the other side of the world, not in the State next door. Another thing, if I write [[Huntsville (Alabama)|]],[[Alabama]] then I get Huntsville, Alabama and two links for the price of one and a bit. Each name takes me to the article the name represents and one qualifies the other. So here's a weird case. There's a huge, districted city called Taipei, and around it is a "county" (really more of a state/province) called Taipei County, which contains lots of full-fledged cities and towns. Mount X or Mount X National Park? Mountains and other destination-worthy natural wonders should use the most common name: Grand Canyon, not Grand Canyon National Park. However, if there are multiple significant attractions within a national park, it's better to make a single national park article instead: Denali National Park, not Mount McKinley. In either cases, make a redirect from the other form. I'm guilty of using the "X National Park" naming. One issue that I see with using something like "Denali" is that "Denali" is the name of a mountain. Denali National Park is the name of the entire park area. Yes, people say they are "going to Denali" when they are going to the park area, but using "Denali National Park" as the article name with a redirect set up for "Denali" seems to make things clearer. I'm not sure that this same issue is there for cities, so the "most common" name seems to work there, but I think using the full name for parks is helpful. This is probably already confirmed somewhere, but... #Shortest_common_form: There is one major exception: U.S. Counties (the local unit of governement in most U.S. states) are always referred to in with the word county included, for instance Cook County. There may be a few exceptions, but I'm not aware of any. -- Mark - just checking - should all US county article names follow the "Cook County" format? There are over 3000 counties in the USA. Not only will the overwhelming majority require disambiguation, but most will need to be disambiguated in conjunction with places on different levels of the geographical hierarchy. With the Long Haul Ahead in mind, it seems to me that it would be a good idea if all US county article names used the "Cook County" format. If this has already been done to death elsewhere, then apologies for proposing this and for my dire searching skills. Thanks, much appreciated - I'll add mention of this to the guidelines. How should the two articles be named? New Castle (New Castle County) <- correct according to the current guidelines? New Castle (city) isn't a feasible option as there's more than one. 1. New Castle County and New Castle (Delaware) use New Castle as disambig page. 2. New Castle (county, Delaware) and New Castle (city, Delaware), again list both as disambig on New Castle. Adams - move to Adams (Walsh County); redirect Adams to Adams (disambiguation) - ? Harney - move to Harney County; redirect old to new Done. Malheur - move to Malheur County; redirect old to new Done. Orangeville - move to Orangeville (Ontario); redirect Orangeville to Orangeville (disambiguation) - ? East Anglia - move back to East England or to East of England - ? I think East Anglia is the usual English name and should be kept. Any Englishmen care to comment? Ellsworth - move to Ellsworth (Maine) - ? Jackson Township - move to Jackson Township (Ohio) - ? Kurdzhali (province) - move to Kardzhali (province) - ? Mesa - move to Mesa (Arizona) - ? Padang Besar - move to Padang Besar (Malaysia) - ? Padang Besar (Songkhla) - move to Padang Besar (Thailand) - ? Rincon - move to Rincón, disambiguate Rincon - ? San Teodoro (Mindoro) - move to San Teodoro (Philippines) - ? Santa Cruz County - move to Santa Cruz County (California) - ? Carroll County - move to Carroll County (Ohio) - ? Champaign County - move to Champaign County (Illinois) - ? Clark County - move to Clark County (Washington) - ? Cook County - move to Cook County (Illinois) - ? Coos County - move to Coos County (Oregon) - ? Crawford County - move to Crawford County (Ohio) - ? Curry County - move to Curry County (Oregon) - ? Durham County - move to Durham County (North Carolina); redirect Durham County to Durham (disambiguation) - ? Fairfield County -> Fairfield County (Connecticut); redirect Fairfield County to Fairfield (disambiguation) - ? Greene County - move to Greene County (New York) - ? Holmes County - move to Holmes County (Ohio) - ? King County - move to King County (Washington) - ? Kings County - move to Kings County (California) - ? Lane County - move to Lane County (Oregon) - ? Livingston County - move to Livingston County (Michigan) - ? Medina County - move to Medina County (Ohio) - ? Mountrail County (North Dakota) - move to Mountrail County - ? Pierce County - move to Pierce County (Washington) - ? Richland County - move to Richland County (Ohio) - ? Stevens County - move to Stevens County (Washington) - ? Stutsman County (North Dakota) - move to Stutsman County - ? Surry - move to Surry (Maine) - ? Thurston County - move to Thurston County (Washington) - ? Wikitravel:Full text of the Attribution-ShareAlike 1.0 license - move to shared:Full text of the Attribution-ShareAlike 1.0 license - ? Searching - see note here: User_talk:Wrh2#Redirection - helps a lot not only when working on disambiguations, but also when you're not necessarily thinking about disambiguations, and I suspect most importantly of all when you were previously not even aware that disambiguations exist. Instead of appearing to be "normal" articles, the "(disambiguation)" suffix provides - at a glance - the most valuable bit of information about the nature of what lies behind the link. Why would a user care about disambiguations? They're looking for a specific place. "what links here" - examples:  /  - direct links to "Someplace_(disambiguation)" are obviously intentional, links via a redirect page called simply "Someplace" are obviously unintentional and need attention; also by making it obvious that a link is from a disambiguation page (and thereby pointing out that such a page exists) - examples:  / . Helps a lot when working on disambiguation issues and when cleaning up in general. There should never be a link to a disambiguation page. Travelers don't want to go to someplace somewhere called Foo City, they want to go a particular Foo City. If an article has a non-disambiguated name and it then becomes apparent that disambiguation is an issue but is not straightforward, a disambiguation page can be put in place without disturbing the original article, and the fate of the non-disambiguated article can be deliberated at will. No changes should be done until a consensus is reached. Likewise if an article is given a disambiguated name and it's then decided that the much-more-famous rule applies, it can be moved without disturbing the disambiguation page and any links to the disambiguation page won't require updating. There should never be a link to a disambig page. Potential for a single naming convention, and eventually for consistency for all disambiguation pages. The naming convention is already clear enough, see below. Potential to render the impossible-to-maintain Wikitravel:Disambiguation page index obsolete. But why torture the user with something as ugly as this? I'll go back through recent edits and check for any questionable city disambiguations. Agree that more real-life examples would be a big help. I think we have to include the word "city" in the name of a place if that's what people call it. I've long thought that New York (city) should in fact be New York City for exactly this reason: People almost always pronounce the name that way. This is also the reason for the US counties rule. Following up on the "Mount X or Mount X National Park" discussion above, as well as some thoughts I had while thinking about the naming discussion on Talk:Mendocino, I'm a bit uncomfortable with some of the arbitrariness of our naming conventions. For example, the article about the "Grand Canyon National Park" is titled "Grand Canyon", despite most national park articles having the "National Park/Monument/Lakeshore" name. There could be some question about whether the article for "Mendocino County" should be titled "Mendocino", despite the fact that almost all US county articles have "County" in the name. The problem here is that there isn't a clear guideline that everyone can agree upon about what is the "most common" name -- if you call a place "X" and I call it "Y" do we compare Google hits to choose the article name, wait for three other people who have been there to chime in, or use some other solution? In cases where a place is known by multiple names, if one name is significantly more common than another then it should be used as the article title. If there is no name that is significantly more common then the least ambiguous name should be used. In either case, the unused name should be set up as a redirect. Thanks, please don't. I'm not sure I 100% understand your proposal, so I want a little while to ruminate on it. A couple of things that come out first: how 'significant' does the difference have to be? Is 60%-40% OK? 40%-30%-30%? In cases where a place is known by multiple names, if one name is so famous that using any other name would be a hindrance rather than a help then it should be used as the article title. For example, the "Democratic People's Republic of Korea" is another name for "North Korea", but travelers will almost universally use "North Korea". If there is no name that is significantly more common then the least ambiguous name should be used. In either case, the unused name should be set up as a redirect. A majority of people who aren't very familiar with the area simply use "Everglades" when referring to the park, so should the article be given the name used by that majority? Anyone familiar with the area would think of the "Everglades" as a region that includes the national park, Big Cyprus, and much of the area up to Lake Okeechobee, so "Everglades" would not be a name that the majority of people familiar with the area would necessarily use. Most of our national park articles use the "National Park" name, so perhaps it's more important to be consistent with other article names? If I had to put a rough number on it, I'd say a place needed an order of magnitude more famosity over all other places with the same name combined for it to be reasonable to drop the disambiguator, and maybe two. Let me also point something else out: before we were using Template:Otheruses, and Wikitravel:RDF Expedition/Related articles, I think that giving one destination guide an ambiguous title made finding the other guides with disambiguators much harder. Naming too many articles "YY National Park"
Qualified agreement, but... I think the South is what we call that region, by a far margin. Canadians do refer to the North as a region, but to a lesser degree. These sound bad without the initial definite article, I agree, and I think we should make a point of using "Northern X" or "East X" rather than "North (X)" where there's an alternative. There are just some parts of the world that are called "The [name of compass bearing]" and making up other names isn't going to work. But I definitely agree that these should be the rare exceptions, not the rule. "Next place up in the hierarchy"
The rules here say that when disambiguating, the "next place up in the hierarchy" should be added in parens. The problem is that this is often very unintuitive (and also not consistently done). For example, my neighboring city of Holland, Mich. is currently called Holland (Michigan)... but that's "wrong" according to this rule, because the next level up in the hierarchy is Western Michigan, so it should be Holland (Western Michigan)... or at least it was until the Lake Michigan Beachtowns sub-region was created, so it should now be Holland (Lake Michigan Beachtowns)... which is a long strip along the coast, so someone may decide to break that up further so it becomes Holland (Ottawa County), which no one except someone from around here would even know where in the world it is! That whole re-disambiguating song and dance should be unnecessary, though. Other than a city within a county (or similar arrangement), we're never going to find two places of the same name within a state or province; there's never a city of Darryl, Vermont, and also the other city of Darryl, Vermont. Holland (Michigan) will always be sufficient to uniquely identify this place, and has the added bonus of being the name (give or take punctuation) that most people would use to find it. But a strict literal application of the rules says it's wrong, and also gives us new article names like Monrovia (Los Angeles County) instead of the more intuitive Monrovia (California). In how many cases is the disambiguator going to be something other than the country? Wouldn't it just be easier and clearer to say the following? England - ??? we have Bath (Somerset) and Birmingham (England) so I don't know what the convention is. In lots of cases; there are ambiguous things within the same country; a very typical example is a city and the province or prefecture that surrounds it having the same name. Can we leave it at "choose the next biggest thing your doohickey is in, or use an even bigger one (like a country) if that seems better?" It seems to me that the country is favored pretty heavily in the description right now, and that if we try to make rules on a case-by-case basis, we'll be sorry we did. (Follow-up to Even, but re-indenting) I agree that there are ambiguous things within a country / state / whatever. For example, Wisconsin has a ton of towns with the same name. However, those are generally rare exceptions, and in such cases we'll probably end up having a discussion about naming anyhow - is it "Foo (province)", "Foo (province, Spain)", etc. Changing the wording to make the common-case obvious ("use the country except for USA, Canada, Australia where the state/province is used) and then adding a note about what to do in cases where further disambiguation is needed (which is what??? "Wisconsin City (Wisconsin County)"? ), seems clearer and easier to follow. Hi Evan - I'm not sure where our disconnect is occurring. You refer to "newly formalized exceptions", but those "exceptions" cover 99% of the disambiguated articles on the site. Todd and I are arguing that those "exceptions" should be clearly stated as being the rule. I honestly don't see how changing #1 on Wikitravel:Article naming conventions#Disambiguation to read like the following suggested text would entail "starting from scratch" or "achieve lots of work shifting around not the name of things but the disambiguator of things". Places in the United States of America use the state as the disambiguator - for example Venice (California). Places in Canada use the province as the disambiguator - for example Windsor (Ontario). Places in Australia use the state as the disambiguator - for example Hamilton (Victoria). OK, I think I finally see what you're saying. We're just going to replace rule #1, and instead of using the nearest enclosing geographical container, we use country first, except where a traditional diambiguator is more natural, like for US and Australian states or Canadian provinces. All the other rules will stay the same -- this is just providing a different default for geographical disambiguators. If I'm getting you right... I think I like it. It does work better than the existing rule. My only requests: I'd rather say, "except where there's a traditional disambiguator, like US or AU states or CA provinces", rather than listing all the traditional disambiguators. There are a lot of countries in the world, and lots of naming conventions, and I'd rather we didn't list them all here. Calling out those three is probably going to get us pretty far. The only concern with not explicitly listing AU, US, and CA as the only exceptions (and as far as I'm aware they are currently the only countries other than England where Wikitravel doesn't use the country as the disambiguator) is that it leaves the same uncertainty about whether to (for example) use French departements, which could be considered "traditional disambiguators". I won't run out and commit hari-kari if the language is more ambiguous, but but I do think having clear and obvious rules would be easier to follow. And as always, if an exception came up where a "natural disambiguator" was called for it could be dealt with on a per-case basis (although I can't think of any examples). The language you suggested about having an iterative rule is included in the current guideline, but my concern here is trying to figure out what the disambiguator should be when that rule kicks in. In the very rare cases where two locations of the same name are located in the same state/province/country, do we use "(region, country/state)" or just "(region)", and what should the region be? In the US, is it counties since they are more static, or should we use the Wikitravel region, which is a "higher level" but less static. For the articles above they are using counties, but there are "higher level" Wikitravel regions that, based on the current guidelines, should be used instead. My hope in bringing this up was that we could decide a clear example that would guide us in the future when we encounter these situations since I don't think the current (or past) rules were very clear. There are pages on Central, North, South, East, but there is no West page. Can someone create the page? What about northwest, southwest, southeast, northeast? Translating place names into English? Do &s in titles break pages? For several reasons, I think we should stick to the simple policy of using the most common name for the place. For LA, for example, I would assume people say "Eastside," not "East." We used to use names like those being recommended here for non-districts, but have moved away from that practice (e.g., Southwest (Colorado) → Southwestern Colorado), to both do away with the need for ridiculous disambiguations like East and to better match the way people speak. Another reason to avoid districts called X/North or X/Southwest is because it creates a conflict with our RDF goals. Also, the first clause of the same sentence advises to keep district names as short as possible. That conflicts with our now standard procedure for districts that amalgamate important neighborhoods, e.g., Chicago/Bridgeport-Chinatown, Washington, D.C./Adams Morgan-Columbia Heights, San Francisco/Union Square-Financial District, etc. I'm going to mostly object here. Of course commonly used names should be used, and I agree that LA/East should be moved to LA/Eastside if that's what it's called. However, I still think it looks really dopey to have districts with completely duplicated names like "Los Angeles/South Central Los Angeles", and I'm not really all that keen on jawbreaker districts like "Washington, D.C./Adams Morgan-Columbia Heights" either. Related to the above, on my lovely island Zealand there are now three subregions; South Zealand, West Zealand and... Nordsjælland - which was started by User:Elgaard back in 2007. So, I've asked a bunch of locals here if they would use Nordsjælland or North Zealand in English (Nord=North, Sjælland=Zealand) and there was a slight skew towards Nordsjælland, 6 to 4. Keep them, which I really don't like, but it might all look different to non native speaker. The places of the Netherlands all use Dutch names, but I am not sure what we should do. How do we name Friesland? An English word for the province is Frisia, but that's also the name of a wider region in Northwestern Europe (including parts of North-Holland, Northern Netherlands, Germany and Denmark). So then the name West Frisia could be used, as it is the mid-western part of that region (as also used in West Frisian Islands), but this makes matters complex, as there is also a West-Friesland/West-Frisia in North-Holland that means exactly the same and is even more at the west. Then, as we do now, we could use the Dutch name Friesland, but this is not the official name of the province, the only official name is Fryslân. And it might sound like Dutch imperialism or something as Friesland is used by the Dutch, while the Frisians use Fryslân. I also doubt Friesland is the most common name in English, but maybe it is, I really don't know. Also, the towns have two names, a Dutch one and a Frisian one. Which one to use? In Frisia, both are sign-posted in both Dutch and (West-)Frisian. But in the rest of the country, only the Dutch name is used. Again, I'm not sure on the most common English name. Hoek van Holland has the English name Hook of Holland. Vlissingen has the English name Flushing. Haarlem has the English name Harlem. Gelderland has the English name Guelders. Zeeland has the English name Zealand. (New Zealand is named after it). Yes, it's also a province of the Netherlands :P But we could use Zeeland for clarity, so the Danish Zealand stays Zealand (though I think a link at the top of the page would be useful to avoid confusion). Large cities get the English name (such as The Hague). Provinces use the Dutch names (but even Noord-Holland and Zuid-Holland? Should we change these provinces into those? I thought North-Holland and South-Holland would be more logical. 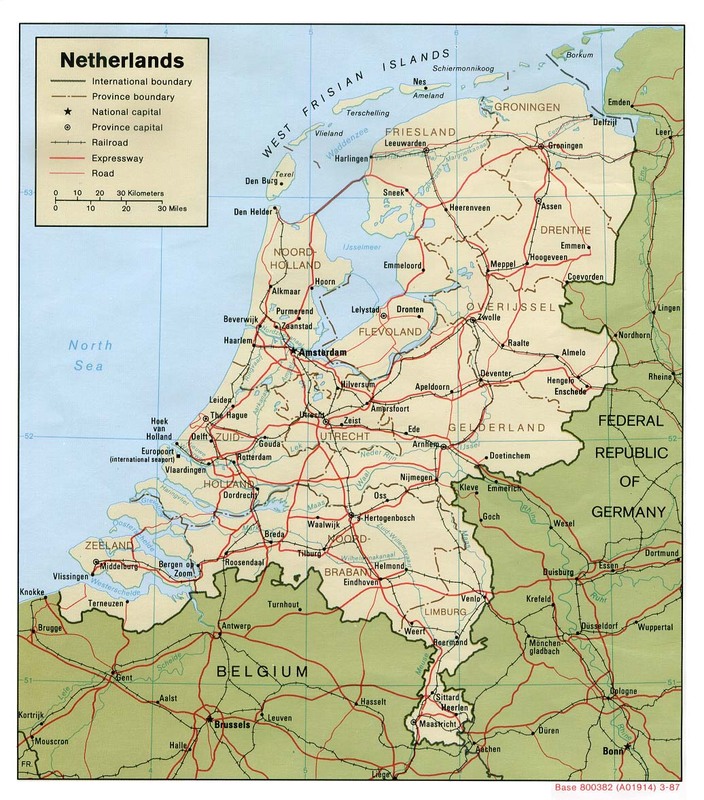 The province Friesland gets the Dutch name, but this is problematic: as the map is from 1987 (it even still says Federal Republic of Germany!!! ), at that time the name Friesland was the official name. Now Fryslân is the official name. So now I still don't know what to do here. But for now, I'll just keep the Dutch names. So should I rename North-Holland, South-Holland and North-Brabant to Noord-Holland, etc.? "As an exception, if one place is so much more famous than others with the same name that the disambiguation is a hindrance rather than a help, leave it without a disambiguator on the end. This is rare, and if you even have to think about which place is "more famous", go back to rule 1." I think this is way too harshly applied, like when I look at the discussion at Talk:Saint Petersburg. Is this sentence really meant in a way that a city as huge as Saint Petersburg needs thought over? I really don't even have to think about which city is "more famous", it's clearly the Russian one. The logic behind the argument to have diacritics and illegible characters is silly. Is there something wrong with using English in the English Wikitravel? Online, Meroe, Krakow, Sao Paulo, etc. are still moreoften unaccented. Probably because of the inconvenience of using characters not used in the English language. And people who do use them are often just copying the native language use, to be cool or whatever. That European cities discussion actually shows nearly total support for Stefan's proposal of "English unless there is none" than for using strange characters. That is also much clearer. Cities just look out-of-place, like the example used in the discussion Chişinău. Chisinau has an English name, so it seems silly that we would not use it and then tell our users to "copy and paste" the name everytime they want to refer to the city. A lot of wasted time, in my opinion. Ærø should be right where it is, at Ærø, with lots of redirects. The Þ (thorn) of Þingvellir is not in the A-Z range, but it's arguably Latin anyway. No relevance to places outside Iceland though, so it's a debate for Talk:Iceland as far as I'm concerned. It's perfectly clear that São Paulo is a permissible name, the debate is about whether the city is more commonly known in English as "Sao Paulo" without the tilde. And just to reiterate what I've said elsewhere; I've no strong opinion on São Paulo - though that's easy to type on a Danish keyboard, it's just Alt+~followed by S, not sure why this is not the case for US keyboards, especially with such a large Spanish speaking population. My main concern with following a strict A-Z policy, is that it's more ambiguous for a number of full-fleged non English letters. Å (which is not an accent, but a letter) is both commonly transliterated as (double) 'aa' and (single) 'a' while Ø/Ö is written as both both 'o' and 'oe'. And then we have a case like Seyðisfjörður where people unfamiliar with the ð would propbably think it's a weird d (which it historically also was), while it's really more like 'th' in modern Icelandic - and tooadd to the confusion - in Faroese it's now purely a tonal indicator - so do we omit it article names then? As it might show, introducing a strict english A-Z policy, will force us to make a complex set of transliteration rules for a large number of letters, which most contributors are not going to read anyway, increasing the janitorial burden even further. I'm much more in favour of the current status quo of just making redirects when needed. I still agree with Burmesedays. Pronunciation is not aided at all by using Ærø over Aero; If anything, it makes it more difficult. Seyðisfjörður which I would read as: Say-yois-fyor-or (and would be wrong!) could just as easily be Seydisfjordur with the Icelandic name listed in the article, like we do with all foreign names. The pronunciation argument still doesn't really pass, as someone mentioned; Cyrillics works better for Russian, kana for Japanese, but we don't name our articles in those scripts. I feel like there is a hidden worry that we will offend or confuse non-native speakers if we use too much English, but I don't see why we should feel guilty for using English in the English version of the site? I'd venture most cities don't have an English name, only large international cities does - it's just that in most countries you only use the A-Z part of the alphabet, or there is a officially defined transliteration of foreign alphabets. I really feel strongly against renaming Ærø to Aro, Aeroe or Aroe. If you look past the first 20 pages of google results for Aero in English, where the majority (some 70-80%) of the results are about the island, the rest of the hits are all about Aeroflot offices in Denmark, the Jean Michelle Jarre concert of the same name held here a couple of years back, aerotech companies, airlines, danish .aero domain registrars and what not, of course it will have many hits when Aero is a real English word. If we go for Aro instead - the first google hits is about the island of Årø, an entirely unrelated island to the west, which can also be written as both Aro, Aaroe and Aaro. And there will be many other cases as the letter Ø, also in fact is a word, it means island - hence nearly all the 800 islands of Denmark ends on a 'Ø' in their names... Ærø, Samsø, Fanø, Rømø (Roemoe really looks horrible btw) etc. Casual users who see the names Ærø, Bågø or Rømø, will probably search for Aero, Bago or Romo, but really, seriously, no one here would connect those names with the islands. I'd personally take them for foreign names if that was put before me in writing. Pronunciation wise, and according to the most widely used transliteration standards, these should really be called Aeroe, Baagoe and Roemoe - Am I making your head spin yet? And it's not just limited to Denmark; Ö (which is also a seperate letter, with the same transliteration issues) is also the Swedish name for an island, and were some to start an article on Gränsö we would have the whole problem with Granso, Graensoe or Gransoe all over again, same goes for Norwegian. I'm quite fine with Ryan's rule of thumb, although I was under the impression that it was the rule all along, and I agree with Chubby that while "obviously" raises the bar a little higher, it's not going to "solve" this problem. Actually, I wouldn't immediately make the connection to the city if I saw "Malmo," whereas I would with Malmö. I think I am of one mind with Jani—the traveler comes first, and it's more useful than not to have the diacritics, partly for pronunciation help, but more importantly for reading street signs. We could use the format "Name ([[Language phrasebook|Language]]: name with diacritics (SOO-doh phuh-NEH-tih-sih-zay-shuhn)," but it would be more concise to just put the diacritics in the name itself and only pronunciation in the parentheses. I agree with Ryan in that I don't really see any reason, from a reader's perspective, to avoid diacritics, or even Latin characters that do not appear in the English language, so long as pronunciation follows the article title in parentheses, and that redirects are set up. Are there different versions of the name? If no, we're done. If there are different versions of the name, is one so much more common than the others that NOT using it would be a hindrance? If so, use it and we're done. An example: Geneva. Otherwise there are multiple versions of the name, and one is not clearly correct, so use the local name. They are hard to type. If we rely on redirects then breadcrumb navigation doesn't display. Did I miss anything? I'm not sure what you mean by "it seemed that there was a desire to avoid diacritics, and there are rules in place against them" - the current naming convention states "Use only the characters of the Latin alphabet for all article names (not just place names). Latin characters are the letters A through Z, capitalized or not, with or without accents/diacritics, and including ligatures (such as æ, Æ)." There are pronunciation advantages to using characters that English-speakers can read, as well, as most people do not want to bother trying to decode place names. I still don't necessarily think that people who want to travel to Sweden will bother to learn much of the language or how to pronouce Swedish. People don't do that much with China, Japan, even Mexico (maybe most non-English countries). And the arguments about pronunciation, meaning changes, and matching bus/train stops are rather mute when we have an anti-diacritic position on Vietnamese, which could "benefit" from all of the same arguments (and once again, the correct name would be on the page no matter what). I tried to look it up, but I couldn't find any reason as to why it is strictly forbidden in Vietnamese when it uses the Latin alphabet with diacritics. The anti-diacritic policy however, makes Vietnamese naming very clear, so we don't have diacritic arguments about it. The fact that Danish people have these characters on their keyboards is irrelevant to the discussion. But it's good that you brought us back to more meaningful discussion about the specific characters/languages. I'd prefer not to use diacritics for Portuguese or Spanish (where the Sao Paulo debate stemmed from). They do not render the names incomprehensible to native speakers or English speakers, and that's always the way most English users would type them and also how I think they are typically written in English. Stefan is right, of course, but dropping diacritics rates fairly low on the scale of offences the English Language has committed against foreign place names. Česká Třebová, Ústí nad Orlicí, Brandýs and Orlicí and Choceň lie on the main corridor line connecting Prague, Brno, Wienna and Ostrava. However, most modern and fast IC and EC towns stop in Česká Třebová only. In Ústí nad Orlicí and Choceň most of rychlík trains stop. In Ústí nad Orlicí you can switch to trains going further to Letohrad. In Choceň you change for Vysoké Mýto and Litomyšl railway. I think the same problem applies in the reverse. If you wikilink Ceska Trebova and it comes up red, you might be missing an already created Česká Třebová article. Ironically, it's actually easier to double check whether a diacritic-less article exists for the visible "diacriticized" version, as it's easy to remove the diacritics, but hard to add them as a redirect for editors less familiar with the local language. I don't think "Česká Třebová" is a "non-English" name—diacritics are perfectly acceptable in English, and used most often for foreign place names... as well as loan words like piñata (pinata looks ridiculous). I don't see any significant disadvantages to including diacritics, only advantages, other than the "hard to type" argument, which conflicts with Wikitravel:The traveller comes first. I'll add another argument pro: as an international site for travelers, I think we should tend towards the international than to the parochial, especially as our site is not at all geared only towards native English speakers (I actually get the impression that our site is better known and more popular among continental Europeans than Americans, who in my experience mostly haven't heard of us). And naming articles like Montañita Montanita looks simply incorrect, not to mention confusing. Ñ and n are different letters for Ecuadorian place names, just as much as o and ö are for Swedish place names. The best way to handle this might be to simply accept that while the existing policy clearly favors Česká Třebová over Ceska Trebova (or Cheskaa Tzhrebovaa or whatever) and Moscow over Moskva/Москва, there will be borderline cases. My suggested policy rewording way up in this discussion would get rid of those borderline cases, but would mean that we'd rename Mexico -> México, which I don't think we want. I've just moved Albany (city, Western Australia) to Albany (Western Australia), because Albany (region, Western Australia) redirected to it. Since we don't have a region called Albany (Western Australia), we don't need to disambiguate between the city and the region. Sadly, that means our classic example on the Naming Conventions page is defunct. Are there any other names that have double disambiguators? I'm continually thinking about subdividing Finger Lakes into subregions. The clear choice for one of the subregions encompasses Monroe County (Rochester's county) and the town/village of Victor. Victor is almost always considered a suburb of Rochester, like all the other towns in Monroe County, but it's in Ontario County. So I don't know what I'd call this hypothetical article were I to create it. Calling it Monroe County is misleading because Victor isn't in Monroe County. But there's no other name in common use; "Greater Rochester" encompasses much more than just one county (in fact, five or seven counties are included, two of which aren't even in the Finger Lakes region), "Suburban Rochester" would seem to exclude the city itself, "Rochester and its suburbs" seems too long-winded. Worse still would be a second subregion I'd want to create, which would be bounded by Monroe County in the west, Lake Ontario to the north, Central New York to the east, and I-90 to the south. I have no idea what to call that, none whatsoever. Are there any precedents to which I might refer? Any suggestions for how to name regions-without-names? This is an important question, also because a number of new articles are being established in Romania these days both with and without these characters. As I understand the policy, we should allow diacritics if the city does not have an English name. Does that not mean that cities like Łódź and Chişinău should be spelled like this? Not that we need to do it the same way as Wikipedia, but over there they use the local spelling. Further, with a very limited knowledge of the languages, the local spelling will help you understand how it is pronounced. What is considered to be the problem with using the local spelling? I think, we need to decide how to do this and then state the naming policy more precisely. Germany has its own official disambiguation system for place names which is used e.g. on road signs and official publications. Mostly they disambiguate by river name, region or district, often in brackets or with a slash. Examples include: Frankfurt (Oder), Frankfurt am Main, Oldendorf (Holstein), Oldendorf (Landkreis Stade), Aschendorf/Ems, Borsum (Harsum), etc. We don't use disambiguation unless there are 2 articles of the same name (i.e. only disambiguate if we have to). We drop the German words for district (Landkreis) or parish (Gemeinde) where they appear. E.g. Oldendorf (Landkreis Stade) becomes Oldendorf (Stade). Swept in from the pub. What are thoughts on using the Hawaiian or English spelling of names, when the names only differ by the use of the okina (ʻ) and kahakō (āēīōū)? E.g. Hawaiʻi or Hawaii, Oʻahu or Oahu, Kalākaua or Kalakaua? Use only the English spellings. Use the Hawaiian spelling the first time a name is mentioned, then switch to the English spelling without comment. Treat it like any other foreign language, and introduce the Hawaiian spelling in a parenthetical note. Just give names in Hawaiian exclusively. I was referring more to the article text, and not the page name, so I think that discussion only applies tangentially. Sao Paulo and São Paulo are both used in English. São Paulo is also used in the local language, thus it is preferred. Agreed that Sao Paulo in reality is probably best without diacritics, since English doesn't use it (although I have also noticed a recent surge of using Spanish/Portuguese diacritics in English). I think it's strange that people are afraid to use English in the English Wikitravel. I guess it's an extension of "political correctness" that has everyone worried that it's somehow "offensive" for us to use English in an English website. I think the above comment, "I don't see why there's a need to be imperialist about preferring "English" spellings" shows that attitude well. Is it really Imperialistic to use English spellings on an English-version website?? The biggest problem I have with the "English names are preferred" argument is that that isn't what locals do when they talk. If I ask locals about a cloth skirt, they'll call it a "muʻumuʻu" (4 syllables), not a "muumuu" (2 syllables, and is a real Hawaiian word that means either "footsteps" or "silent, mum"). If I ask how to get to Ala Moana Center, they'll tell me to turn on Piʻikoi Street (3 syllables) even though the road sign reads "Piikoi Street" (2 syllables, if you pronounced it as written). Whew, a lot of confusion here. I'm going to try and spruce up Wikitravel:Naming conventions, since it's clearly unclear! The article was moved away from Wikitravel:Article naming conventions to emphasize that it is for all naming, not just article naming, so spellings should be consistent everywhere. If in doubt, the default is local naming conventions, so you would write Piʻikoi St. Accent marks and diacritics are part of the Roman alphabet, and are perfectly acceptable in English prose. Names such as "Hawaii" and "Oahu" are so commonly spelled without the ʻ, that we should omit it. Aside, perhaps, from a pronunciation explanation next to the article title. This page was last edited on 4 June 2012, at 09:08.